Note: This sensor is not recommended for new design. This product is obsolete. 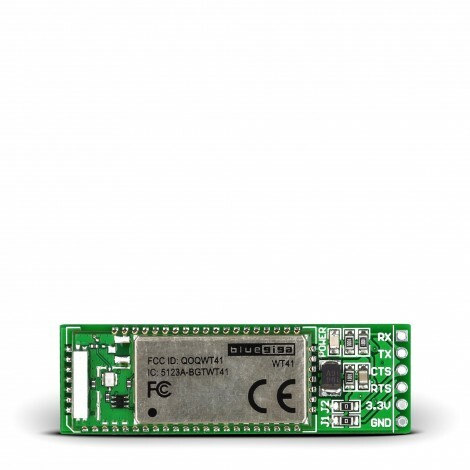 BlueTooth 2 Stick Board offers low power, highly economic wireless capability to your products. On-board WT41 offers impressive 1000 meters range between two bluetooth modules. It uses easy and simple UART protocol for communication. BlueTooth 2 Stick Board offers low power, highly economic wireless capability to your products. On-board WT41 is truly a long range Bluetooth module offering impressive 1000 meters range between two WT41 Bluetooth modules. It uses easy and simple UART protocol for communication. Key Features Fully qualified Bluetooth 2.1+ EDR module. Exceptional radio performance (TX power: +20 dBm, RX sensitivity: -90 dBm). Includes iWRAP™ firmware with all relevant Bluetooth profiles and simple control interface.